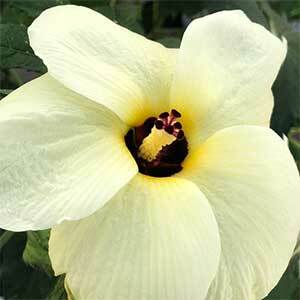 A small growing plant with attractive flowers Hibiscus moscheutos is commonly known as the Swamp mallow. Flower colour ranges from creamy white through to pinks and reds.The flowers are large with 5 petals slightly pleated. This is a plant that grows well in wet soils, so excellent for water gardens or for growing along pond margins. It will also grow and flower in light shade, making it a very useful landscaping plant. Best planted in a moist soil in part shade. This is a deciduous plant and it requires little attention or extra care once established. This is a plant that does not like root disturbance. Be careful when planting not to disturb the rootball. As the plant drops its foliage, you can prune it back the ground, however wait until late winter to early spring. It will then look tidier and will re shoot in mid spring. You can also prune back the new stems by half near the beginning of summer to force a more compact growth habit. Position – Full Sun to part shade. Soil – Best in moist to wet clay soils and will tolerate periods of water logging. Spread – Will form a clump to around 1 metre. Flowers – Red, Pink to Cream.